Hotel Mariinho is located in the historic part of the city by the sea. 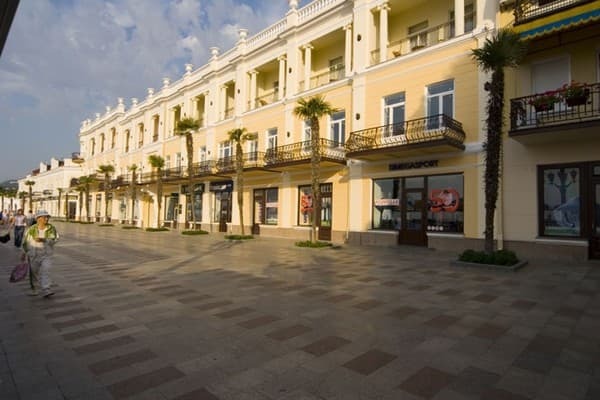 Guests of the hotel can enjoy the sea surf and the splendor of the Yalta coast at any time of the year. 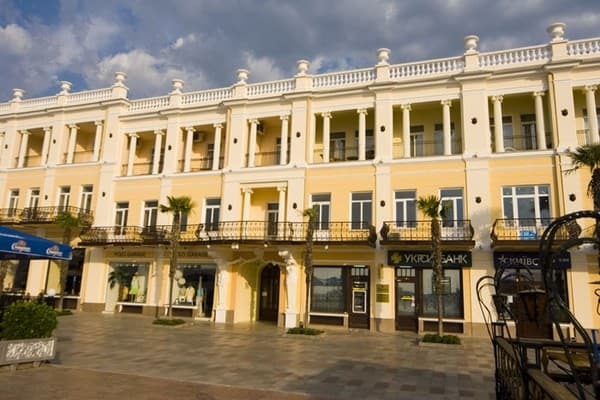 The hotel is a 3-storey old building with parapets and decorative vases on the roof, a monument of architecture of the XIX century. 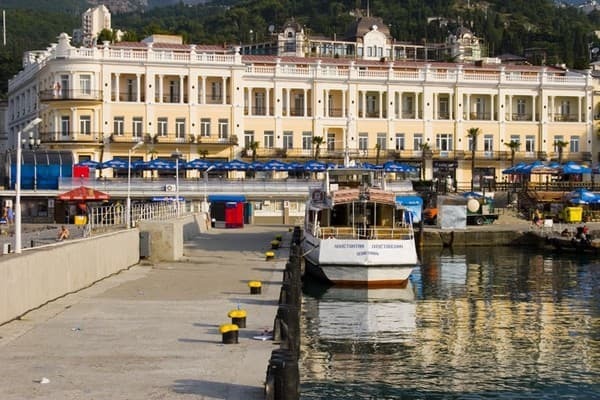 - a real decoration of the embankment of Yalta. For holidaymakers, VIP rooms and 2, 3 and 5-room apartments are offered. On the 1st floor of the hotel "Marino" works a first class restaurant "Voltaire", in the elegant menu of which the best dishes of European and Oriental cuisines. To the beach - 5 minutes walk. PRICES MAY CHANGE, IT IS REQUIRED TO RECEIVE INFORMATION FROM THE OPERATOR. Description of the room: Exquisite 5-room VIP-class apartments, furnished in a classic style. In the bedroom there are sets of natural bed linen and soft orthopedic mattresses. In the bathroom there are terry bath sets, mini perfumes. There is the possibility of placing on additional places. Rooms are cleaned daily. Description of the room: Two-room studio with all amenities. The room consists of a hall, a bedroom, a large bathroom. In the bedroom there is a double bed. Possibility of placing on an additional place. Rooms are cleaned daily. Description of the room: Cozy 2-room studio. The bedroom and the living room are connected by an arch. The room has a double bed, sofa, coffee table, satellite TV, air conditioning. Lovely view of the sea, 2 balconies with wicker furniture and sun loungers. Accommodation on additional places is possible. Rooms are cleaned daily. Description of the room: Comfortable room with isolated rooms. It consists of a bedroom with a double bed, a living room, a bathroom with a shower, 2 balconies with rattan furniture. Lovely view of the sea. This room can comfortably accommodate two more people. Rooms are cleaned daily. Description of the room: A large room consisting of a hall, a living room, a bedroom with a double bed, a large bathroom with a window and a corner bath. Two loggias with rattan furniture and panoramic sea views. There is a possibility of placing on an additional place. Rooms are cleaned daily. Additional places are provided free of charge. 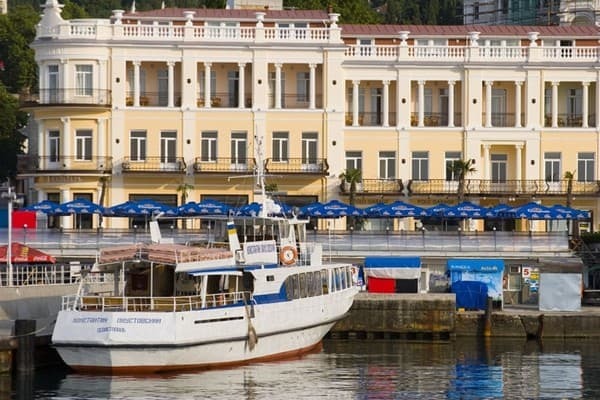 Hotel Mariinho is located in the historic part of the city on the waterfront. Paid and free city beaches are 50-100 meters from the hotel. From the railway station in Simferopol to Yalta by bus, shuttle bus. 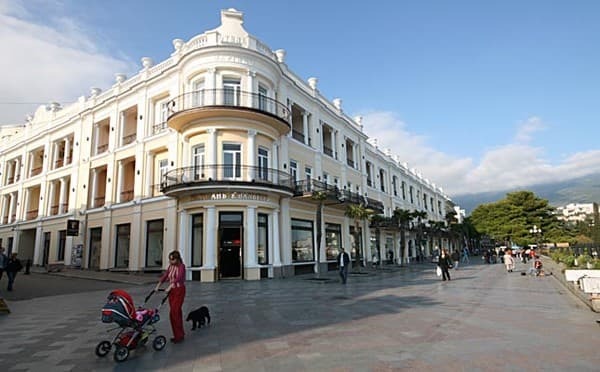 From the bus station of Yalta by taxi or minibus taxi № 1 to the stop "Morskaya", then across the road to the hotel "Marino".